When 2011 Dazed x Converse Emerging Artist Award finalists Samuel Levack and Jennifer Lewandowski realised they were dissatisfied with the London art scene, they took matters into their own hands. They turned their home into French Riviera, an east London gallery space, lit up by a blue neon light on Bethnal Green Road. At the gallery, the artists showcase their own work as well as that of other emerging art rebels without representation; artists that break boundaries and cross disciplines. Their current exhibition, “Alternative Equinox”, is a two-part moving image and architectural installation both inside and outside the space. We discover what went down during part one and what we can expect for part 2, including their exciting performance programme curated by Attilia Fattori Franchini. Below, we speak with the duo. What inspired the project ‘Alternative Equinox’? Samuel Levack and Jennifer Lewandowski: ‘Alternative Equinox’ came about after conversations and walks through London, where we began filming the architecture of the city and creating intimate portraits of friends, while exploring ideas around self-development, expression and renewal and observing the process of gentrification. 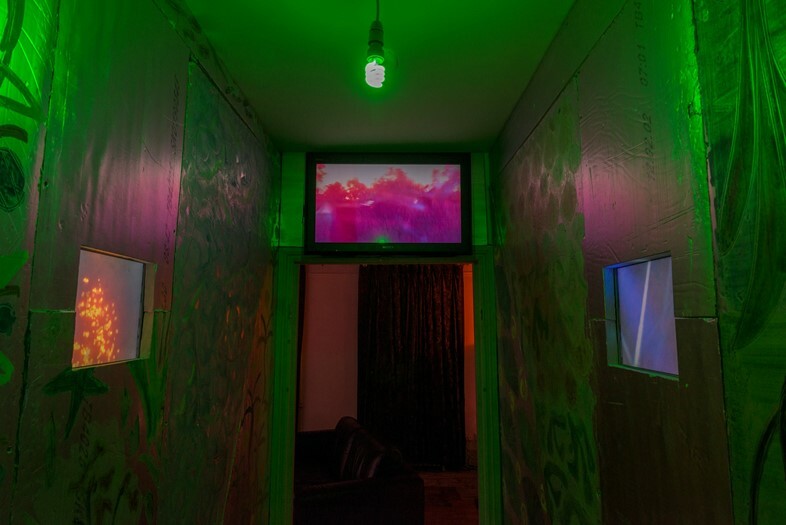 A number of the films were shot on or around the spring equinox of 2014, a time when the length of day is equal to that of night, and subsequently these films became the central focus of the installation. How does your work respond to artistic society in London? Samuel Levack and Jennifer Lewandowski: Our response to the question of how artistic society functions in London in 2015 was to create a personal narrative on a journey through our former home. We presented new works among a series of architectural interventions, which together explored and uncovered the fabric of the building and considered the shared histories of the place across generations. Samuel Levack and Jennifer Lewandowski: Music has been a central element in our artistic practice for the last few years, and other recent installations have featured performance as the focal point, so with this latest project we wanted to break the paradigm. However, the aura of our music radiates throughout the space and in the films, and these new tracks are taken from Das Hund’s forthcoming debut EP. Samuel Levack and Jennifer Lewandowski: The gallery came about because we had the use of a small, but prominently located shop-front space on Bethnal Green Road, and we felt that there were a number of important emerging artists among our peers in this community, who were being kept out of the existing gallery system. The exhibition programme aims to show the most exciting emerging artists from London and around the world and continues to focus on artists who are not represented by a commercial gallery in the UK. What can we expect for part two? Samuel Levack and Jennifer Lewandowski: For part one we worked with the rooms in the house above the gallery, striping back all contents and highlighting certain architectural features – the focus of our concern was on the intimacies of the building and to take the audience on a journey that juxtaposed calm and chaotic spaces. For part two, we will reconfigure the elements on the ground floor of the house, as a new site-specific installation. 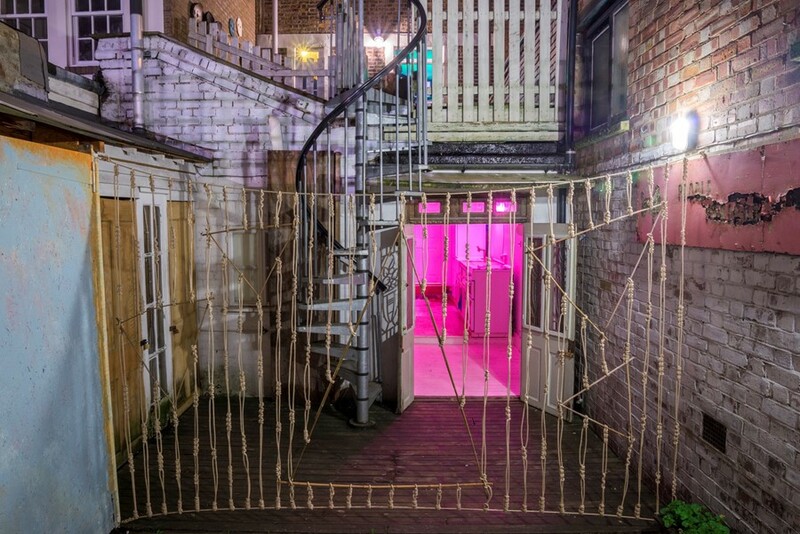 We have also invited Attila Fattori Franchini to curate a performance programme that will respond to the ideas explored in ‘Alternative Equinox’, while acting as a bridge between the city street outside and the domestic home environment inside. The performance programme will feature four new commissions from Berry Patten, Megan Rooney, Patrick Goddard and BADFOOD.